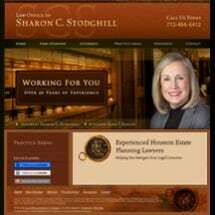 From our office in Houston, Texas, the Law Office of Sharon C. Stodghill has provided comprehensive legal counseling to clients on matters involving probate law and estate administration, estate planning, guardianship, elder law, business organization and real estate transactions. Our law firm, which was founded in 2000, offers a unique combination of practice area experience and focus that has proven to be beneficial to our clients. Our lead attorney, Sharon Stodghill, is board-certified in estate planning and probate law by the Texas Board of Legal Specialization. We realize that every client is unique, so we take the time to learn the nuances of each case, as well as the concerns and objectives of each client. Our Houston estate planning lawyers have more than 20 years of combined experience helping people create comprehensive estate plans. At the Law Office of Sharon C. Stodghill, we understand that estate planning means sharing sensitive information, so we respect and safeguard our clients' confidences at all times. It's a widely held misperception that estate planning is only for extremely wealthy households. Many of our clients have modest estates, yet have benefited greatly from having a proper estate plan in place. The Law Office of Sharon C. Stodghill also guides surviving family members through probate, the difficult process of distributing assets after a person's death. We understand that dealing with the court system while you are reeling from the loss of a loved one can be very difficult. We do our best to streamline the procedure and provide cost-effective solutions. When you are looking for a lawyer to handle important issues, such as creating an estate plan, probating an estate or establishing a guardianship, you need to find someone you can trust, someone who will protect your interests and your family. At the Law Office of Sharon C. Stodghill, we have more than 20 years of combined experience helping people create comprehensive estate plans. If you are confused by the probate process, the Law Office of Sharon C. Stodghill is here to help. We understand that dealing with the court system while you are reeling from the loss of a loved one can be very difficult. If your elderly parents or a loved one with special needs seems to be unable to make decisions, handle money appropriately or otherwise care for themselves, you may want to consider seeking a guardianship. At the Law Office of Sharon C. Stodghill, we are ready to sit down with you, learn about your goals and build an estate plan that protects you, your loved ones and your assets.